The Immortal Awards returns today, launching the call for entries for its second annual international advertising award. Little Black Members can submit their entries for this year’s competition now. Debuting last year, The Immortal Awards is simply about celebrating the best creative work in the world – with no confusing categories of chunky entrance fees. 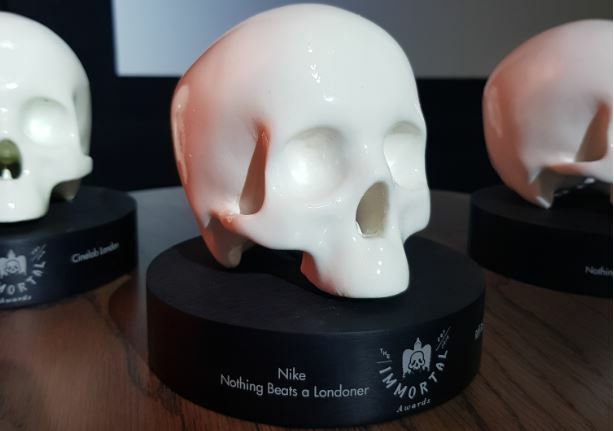 A modern award for the new world of advertising, The Immortal Awards will once again be super straightforward and free-to-enter for all Little Black Book members. Following a hugely successful debut year, in which the inaugural world-class jury set an incredibly high standard for years to come, just four campaigns were deemed Immortal. The highest honour available, Immortality is only awarded to projects that will have a lasting impact on the brand or the industry and which raise the bar. The jury were impressed by the high quality and diversity of the work shortlisted, also awarding Commendations to 12 pieces that they saw as exceptional campaigns and stand-outs for 2018. A further 23 pieces achieved finalist status, distinguished from the initial shortlist as pieces with creative merit that warranted further debate and discussion. The Immortal Awards is currently embarking on a global showcase tour, screening the 16 Immortal and Commendation winners to audiences around the globe. Kicking off in London in February, the next stop on the tour is at Framestore in LA on Thursday 4th April. More dates and locations will be unveiled soon. Entries into The Immortal Awards will be accepted until September 9th 2019. All entries must be made for a commissioning client, and must have first aired, broadcast, displayed, launched or published between 1st September 2018 and 31st August 2019. Every member of LBB is entitled to up to five entries, depending on their membership tier. Bronze members receive one entry, whilst Silver members get two entries and Gold members get five. If you’d like to enter the Immortal Awards but you’re not yet a member of LBB, email Lynchy at michael@campaignbrief.com today. If you’re already a member but would like to submit more projects than your allocated entries, you can upgrade your membership to Silver or Gold by emailing Lynchy. Start your path to immortality today. Not an LBB Member yet? LBB is represented in New Zealand and Australia by Campaign Brief. Email Lynchy for details.